Tuesday was a special day. Originally I was meant to go to a tasting of Jura with the distillery manager, but that got cancelled at the last moment. 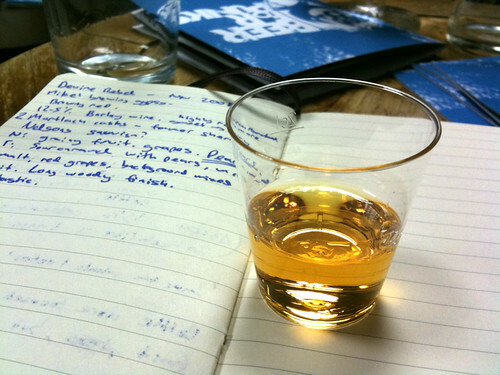 Then a message popped up on the BrewDog blog that they’d be running a tasting at The Rake. Perfect timing it seemed, to start with, until I realised that my recent weeks away from town had moved my chubby fingers even further from the pulse of London than normal and I’d missed a key fact about the day – London Underground were going on strike. Plans were made, starting with working from home and culminating in a train and bus meander into London Bridge. However, in the manner of all good plans, I foolishly changed my mind at the last moment and my bus/train/train/train plan turned into bus/train/train/walk, leaving me at Waterloo a bit later than I hoped and The Rake a decent walk down the road. I turned for the first time to London’s new saviour – the hire bike (aka Boris Bike [even though the plan was initiated under Ken Livingstone] aka Red Ken’s Unmotorised Metal Steeds [an acronym that I am trying to push without much success]). So, I arrived at The Rake redder in the face than normal, sweating more than normal, significantly deader than normal and in need of a beer even more than normal. The second of my brace of pre-tasting beers was a preview of Abstrakt:03 aka AB:03, the next in the Abstrakt series and follow up to the Abstrakt:02 that I tasted earlier in the year. In Abstrakt fashion it’s one of BrewDog’s experiments released in one batch with the caveat that the recipe will not be repeated and this time it’s one of their early IPAs, brewed at 9% and then matured for 2.5 years in some 1965 Invergordon whisky casks with strawberries and raspberries. 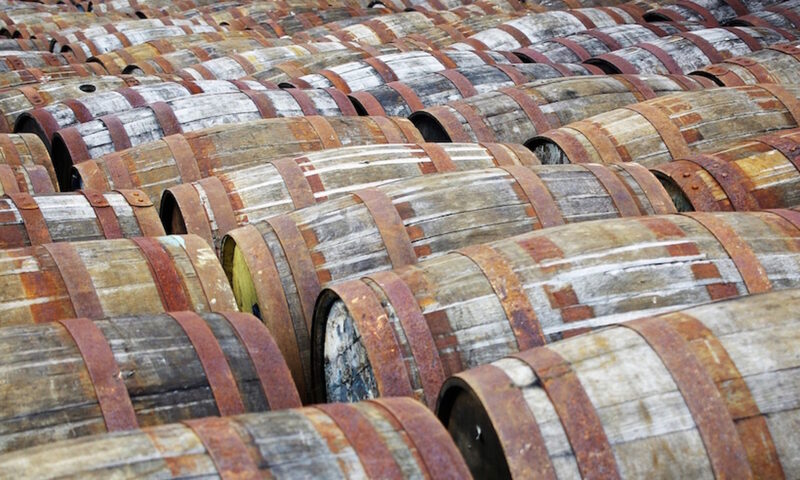 The whisky was bottled at 42 years old and each of the 10 casks was filled with the IPA and 20kg of strawberries from brewery co-founder Martin Dickie’s grandmother’s strawberry farm (as picked by the BrewDog staff). After a couple of years 2kg of raspberries were added to each barrel for a finishing sourness. The beer has been recarbonated, as many of BrewDog’s aged beers are, and this carbonation level was the only real difference between the keg version I started the evening with and the bottled version I tried later at the tasting. The beer poured flat and red, as you’d expect for something with 22kg of red fruit per cask, and didn’t have all that much to the nose other than a slug of sour fruit. To taste that sourness came through, with the raspberries dominating the underlying sweetness of the strawberries and complimenting the bitterness of the base IPA – it was more sour cherry than berry. The wood seems to have done more accentuating than adding, with an oranginess coming out heavily at both ends of the flavour, almost adding a citrus pettiness to the beer, although there was a hint of smokiness that may have come from the rather exhausted wood (42 years of whisky maturation is going to pull out quite a lot of what the cask had to give). There was also a less hoppy bitterness that my notes suggest was ‘like sucking a peach stone’ that popped up in the middle along with some sweet fruit. A very interesting beer that tasted almost like a belgian sour cherry beer than an fruity IPA. Shortly after finishing my beer, and having a chat with Neil from Yet Another Gin who popped by on one of his whistlestop tours of the bars of London, I was called in for the third tasting of the night, having grabbed a ticket from BrewDog’s London sales manager Tom Cadden, and made my way to the rather full upstairs room where BrewDog boss James Watt was waiting to pimp his beer at us. We moved on from there to the Devine Rebel Mortlach Reserve. Originally brewed in collaboration with Mikkeller in November 2008, the beer started out as a 12.5% barley wine before they decanted it into two Mortlach whisky casks that had held sherry before the whisky. These were then left until a few weeks ago when they were bottled, advertised on the website and quickly snapped up by the BrewDog fanboys, including three that went to me and arrived a couple of days after the tasting. Before bottling they highly recarbonated the beer in an effort to control the sweetness, as carbon dioxide has a souring effect on liquids it is dissolved in (hence the sweetness of flat soft drinks and the sour flavour of carbonated water). It poured deep brown with a hint of orangey red and smelled of fruity grain, grapes and overwhelmingly of perfectly ripe pears. To taste there was more pear, sour caramel, uncooked malt, red grapes and a general background of mixed fruit as you often find with barley wines. It had a long woody finish which lingered with the fruitiness and, in short, it was fantastic. One of the best beers I’ve tasted and one that I’m very pleased I have a few bottles of. All I’ve got to do now is make sure that I save two of my three to sit on the side and wait a bit, as it should age well. Last of the night was the beer that we had all come to try and the reason that I had made the journey across town on strike day – The End of History. The final chapter in BrewDog’s super strong beer war with German brewer Schorschbräu this 55% beer beat the german’s previous effort (a 43% version of the Schorschbock) and BrewDog have announced that they will do no more of these stupidly high alcohol brews. I suspect that this is in part due to a ‘get out while the going’s good’ approach to the publicity that they have garnered, as well as a more practical topping out of their freeze distilling process – it seems that to produce this beer they not only needed their local ice cream factory (-20ºC) and their industrial chiller (-40ºC) but also a piece of medical cryogenic freezing equipment (-60ºC) which was leased and has to go back soon. Each of their super strong beers has had a different base beer, with the Tactical Nuclear Penguin using an imperial stout, Sink the Bismarck an IPA and this one a belgian blond (infused with nettles and juniper berries), and this has led to each of them being quite distinct in flavour. However, flavour isn’t the main reason why people have been interested in The End of History. The first of the two things is the price, with it coming in at £500 and £700 per bottle, amounts that have led to BrewDog’s claim that it is not only the world’s strongest beer but also the most expensive. However, the beer inside the bottles is not the main source of the price, instead it’s the second reason why people know about it, the packaging. 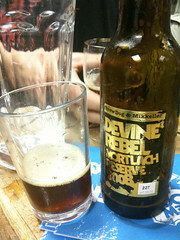 Only 12 bottles were made available to the general public (although I suspect that a chunk more beer was made and not part of those 12, to allow tastings and the like), which sold out in tow hours, and each was then placed inside an expensively taxidermied stoat or squirrel – the stoat brought along to our tasting was called Susan. This is a bit of a classic BrewDog move – deliberately shocking, ready-made for the media to pick up and with a point behind it that some will see as the excuse for the first two bits and BrewDog claim is the main reason why they did it (in this case, trying to make a point about beer as a luxury item and something hand wavy about honouring the lives of dead animals – the stoats and squirrels used were already dead rather than killed for the project, with the word ‘roadkill’ appearing often). I rather like the advertising campaign myself, tasteless as it is to many, and was rather pleased to be able to meet Susan. She was lovely. There is, of course, a video. 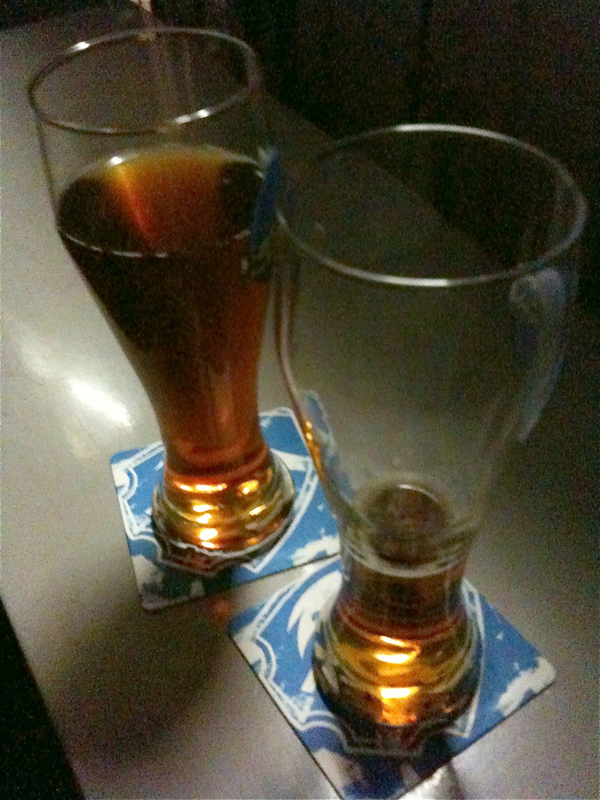 So, the ‘beer’: We were presented with a baby shot each and it was a beautiful golden colour, shining under the room’s lights. On the nose it had oranges, concentrated malt, citrusy hop and a hint of dry hops. To taste it started with an intense sweet citrus hit fading through fizzy refreshers (although uncarbonated) to seville orange, with hints of beery malt and bitterness, and with a long bitter orange finish. In true whisky drinker fashion I added a drop of water to see what happened and it softened out some of the alcoholic hit, brought out more bitter orange but helped it all amalgamate into more of a constant whole. Overall it was pretty impressive and definitely more of a proper drink than I felt the Sink the Bismarck was – I find it disappointing that this isn’t something that’s going to appear again and that it will be almost impossible taste outside of the occasional BrewDog special occasion. 7.8%. Limited availability on draft. Available from BrewDog for £1.79 per bottle. 9%. Available soon from http://abstrakt.com. £3 per half at The Rake (now run out). Probably £9.99 per bottle when released. 12.5%. Sold out. £11 per bottle while available. 55%. Sold out. It was £500 or £700 a bottle (stoat and squirrel respectively).